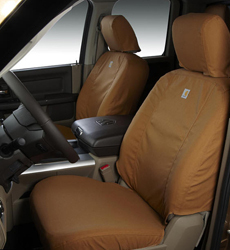 The Covercraft SeatSavers Custom Seat Covers are now available in the famous rugged and durable Carhartt® material. 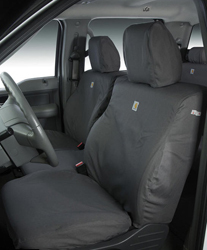 These seat covers are tough as nails with heavy duty, firm-hand Carhartt® duck weave fabric and triple stitched main seams. Each seat cover features storage pockets with signature Carhartt® rivets and a durable, water-repellent finish. So these seat covers will always look good no matter how you treat them.